'This book is so good you won't blunking believe it!' Tom Fletcher 'Hilariously funny and inventive, and I love the extraordinary creatures and the one thirty-sixth troll protagonist...' Cressida Cowell 'A rip-roaring, swashbuckling, amazerous magical adventure. Comedy Gold.' Francesca Simon`This hotel gets five stars from me' Liz Pichon'A splundishly swashbungling tale of trolls, goblins and other bonejangling creatures. Put on your wellies and plunge into the strangest hotel you will ever encounter. This is a hotel I hope I never find! Wonderfully, disgustingly funny.' Jeremy Strong`What a fun hotel! Book me in immediately!' Kaye UmanskyWelcome to The Nothing to See Here Hotel! 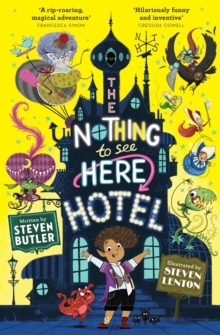 A hotel for magical creatures, where weird is normal for Frankie Banister and his parents who run the hotel. When a goblin messenger arrives at The Nothing to See Here Hotel, announcing the imminent arrival of the goblin prince Grogbah, Frankie and his family rush into action to get ready for their important guest. But it soon becomes obvious that the Banister family are going to have their work cut out with the demanding prince and his never-ending entourage, especially when it turns out the rude little prince is hiding a secret... The first book in a fabulously funny series by bestselling author Steven Butler, with a host of whacky characters brought to life with illustration from the wonderful Steven Lenton!